Well… How can I say this? I just didn’t like this book. And I’m quite upset about it because I’ve been wanting to read it for a long time and it really disappointed me. Honestly. 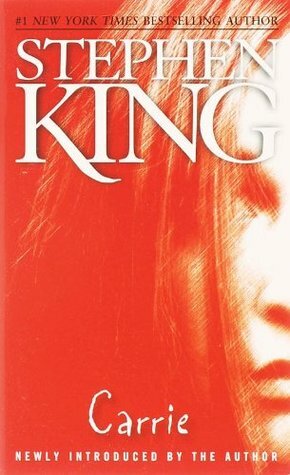 When you think about Stephen King and especially Carrie what are some of the first things that come to your mind? Because for me it’s: really scary, creepy, weird unexplained things happening, more scary, great writing, extremely scary, un-put-downable. Well from all these things the only one that was accomplished for me was the “weird unexplained things happening”. For the first half of the book everything was going okay. Not really good, but acceptable. And then, when I thought “now the real thing will start”, it started becoming worse and worse! First of all, the whole book was revolving around one single event. When I realized that I thought “Okay, at least it better be good!”. And it so wasn’t. The event in itself was quite big, to be fair. But the way it was described and the feelings of Carrie during that event where very unemotional and just lukewarm. When you’re writing a whole book around one thing and building anticipation and excitement and curiosity about how it will all go down, you can’t describe it almost with no emotions at all. And you can definitely not describe it from a secondary character’s point of view. But that’s exactly what happened. Even worse actually, because the point of view was not from only one secondary character, but from so many! Some of them were actually not even mentioned in the book before that. They just randomly appear towards the end of the book and we’re stuck reading from their perspective. Quite frankly, I don’t freaking care what a random person / character has to say about what happened! I want to experience what’s happening first hand from the perspective of Carrie or some other important character and not some stranger who doesn’t even know what has been going on! Not to mention that they weren’t even there when everything went down, so we learn everything from these secondary characters talking to some of the main characters and asking them what had happened. I mean, WHAT? WHY? This really frustrated me to no end. The only positive thing I could find about this book was the dynamic between Carrie and her mother. Her mother is an obsessively and extremely religious person who makes Carrie go through a lot of different punishments in order to pay for her sins. Of course this plays a major role to how Carrie evolves as a person and pretty much shapes her personality. So I really thought that Carrie’s reactions and her relationship between her and her mother was a very well described part of the book. Also the scenes with the punishments ended up being the most emotionally hard, but also exciting scenes in the whole story. In general I was very disappointed by this book. I had really high hopes for it and expected to read something truly scary and twisted, and it ended up being anything but that. I’ve heard quite a few things about this book, so obviously others have seen something in it, but I really cannot see it. I might try watching the movie, though. I have a feeling I might like it better. It was reliably reported by several persons that a rain of stones fell from a clear blue sky on Carlin Street in the town of Chamberlain on August 17th. Completely disappointed in this book. The story wasn’t what I expected it to be. I had some serious issues with the writing style. Generally, not my cup of tea.